Steel brushes are used in a wide variety of industrial settings because their bristly steel wires are capable of heavy duty cleaning or deburring. They can also be used for finer finishing work like polishing. 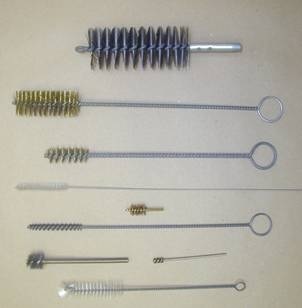 Brushes of various sizes are used to remove rust from metal, remove contamination or deburr a rough surface. Steel Brushes Steel brushes are used in a wide variety of industrial settings because their bristly steel wires are capable of heavy duty cleaning or deburring. They can also be used for finer finishing work like polishing. 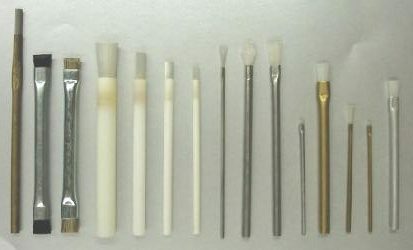 Brushes of various sizes are used to remove rust from metal, remove contamination or deburr a rough surface. A steel brush on a roller is usually mounted over a conveyor belt in an industrial setting. Objects run underneath the roller and the contact with the spinning steel brush cleans the object. Small circular steel wire brushes can be manufactured to fit most common power drills. The drill creates a rapid rotation for the brush so that it can quickly remove dirt and rust upon contact with an object. The only time that steel brushes should not be used is in an environment where flammable liquids or materials are present. The friction of steel wire against other materials at high speeds will create sparks that could fly in any direction. Safety glasses should be worn around a powered steel brush. Steel brushes are often used in welding shops to smooth out ripples and rough edges in joints that have been welded. After being treated with a steel brush, welded corners will be smooth and seamless with the rest of the metal.